Let's face it...how to lose weight fast isn’t the answer you should be searching for. Rather, it's losing weight and keeping it off for good that is the real goal. After all, you don’t just want to lose weight quickly and then have it all pile back on, right? If you want to know how to lose weight for good then the most important thing to remember is that you need to move more and eat less. It's a pretty simple formula but for some reason so many people get it wrong (approximately 66% of North Americans!). 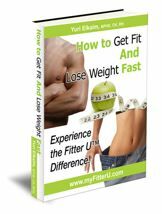 These 2 weight loss components (exercise and diet) can be further scrutinized and detailed for better understanding and application. So here are 5 ways to help you lose weight fast. Apply these strategies today and consistently over the next few weeks and you will reap the benefits. Exercising first thing in the morning is a fantastic way to crank up your metabolism for the day ahead. If your body's not used to getting out of bed and moving right away then just start with some brisk walking. Eventually, you want to build up to working up a good sweat for at least 20-30 minutes to get your day started. If your goal is to lose weight, then getting your heart rate elevated and boosting your metabolism throughout the day is critical. The earlier you can rev up your metabolism the better. This is important since your basal metabolic rate accounts for 70% of all the calories you burn each day. 2. Strength Training is Key! How much more research do you possibly need to hear about to realize that strengthening your muscles is the KEY to maintaining a healthy lean body for life? Since muscle mass one of the biggest contributors to your metabolic rate it follows that the more muscle (less body fat) you have, the greater your metabolic rate - it's that simple. This means that even at rest you'll be burning more calories than someone who has less lean body mass than you. • Follow a well-designed strength training program that stresses your muscles at least 2-3 times per week with a weight that will only allow 6-10 reps (women too!) for 2-3 sets. • Use full body exercises such as squat presses, lunges with biceps curls, or dumbbell cleans; instead, of single muscle exercises like seated biceps curls. The more muscle you involve, the more calories you burn. Interval training rocks! Don’t get me wrong, long and slow cardio works as well – if you have 3-4 hours per day to spend exercising at a snails pace. When it comes down to it, interval training is by far the best form of cardio for burning fat and improving all other facets of your cardiovascular fitness. And, it is also much more time efficient. With as little as 10 minutes you can drop more sweat and burn more fat than most people do an hour! • Sprint-Jog – Sprint for 30 seconds, then jog to recover for 60 seconds. Repeat 10 times. 4. Nothing Beats a Raw Food Diet! Eating more raw foods is one of the most powerful ways to help you lose weight fast! I know of no raw foodist who is overweight and, in fact, the first thing most people notice when they start eating more raw foods is that the excess body fat simply disappears. Although you don't have to become 100% raw, enjoying more of your fruits and vegetables in their raw living form through the use of fresh juices, smoothies, and salads will literally transform your life! • Try a raw vegan restaurant in your area - you'll be surprised at how amazing it is! If you want to lose weight fast, then you need to cleanse and detoxify the toxins and acid accumulation in your body. Because your body, as a means of protecting its vital tissues and organs, stores these dangerous compounds in its fat cells. As a result, your fat cells swell and your body increases. The number of fat cells doesn’t multiply, they simply increase in size. In order for these fat cells to shrink they must not be as “needed”, meaning that there should be less acid and toxic residue in your body. Less garbage means that less garbage bags are needed. Get the analogy. For most people, cleansing can be as simple as removing many of the allergenic and inflammatory foods such as wheat, dairy, refined sugars, and animal products, and consuming higher amounts of alkalizing greens vegetables and their juices. • Start your day with lemon water – lemon is a great liver cleanser and awakens the digestive system as well. • Drink tons of water – “mother nature’s” fruit juice is truly the best way to flush toxins out of your body. Drink at least half your body weight (lbs) in ounces. So if you weigh 200 lbs, you should be aiming to drinking 100 oz of water a day. • Use a digestive enzyme when eating cooked meals – cooked foods are void of the enzymes necessary to digest themselves (raw foods are enzyme). As a result, your body has to waste its own enzymes and energy to break down these foods. To alleviate the stress on your body, take 1-2 digestive enzymes with your cooked meals. • Eat less! Eating less allows your body to spend more of its energy on breaking down immune complexes and repairing damaged cells. The digestive process can take up to 80% of your body’s total energy. That’s why you feel tired after a heavy meal. Lessen the strain on your digestive system by eating smaller amounts and eating less often throughout the day.